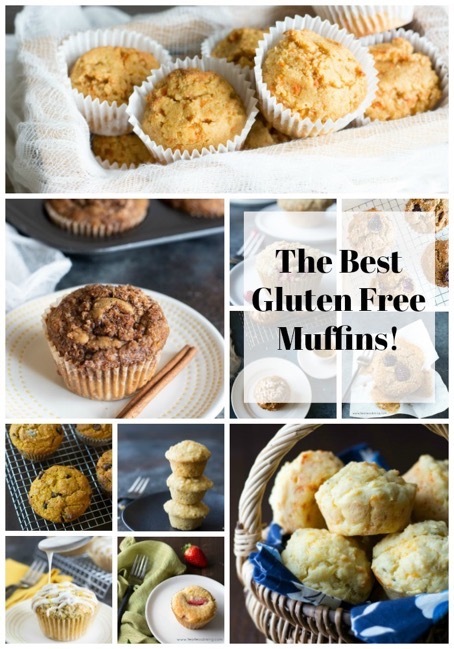 I pulled together my most popular gluten free muffin recipes so you had lots of delicious options to make for your family and guests. These muffins are made with all of the good stuff! Sometimes people don’t realize you can still bake delicious baked goods when you eat gluten free. 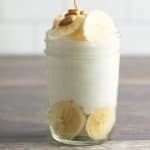 The best part is that these recipes make even better treats because they are so moist and flavorful. Unsure where to start with gluten free baking? Please take a look at my gluten free pantry guide to learn which gluten free flours work the best for baking. I think you will find a ton of helpful information to get you started! 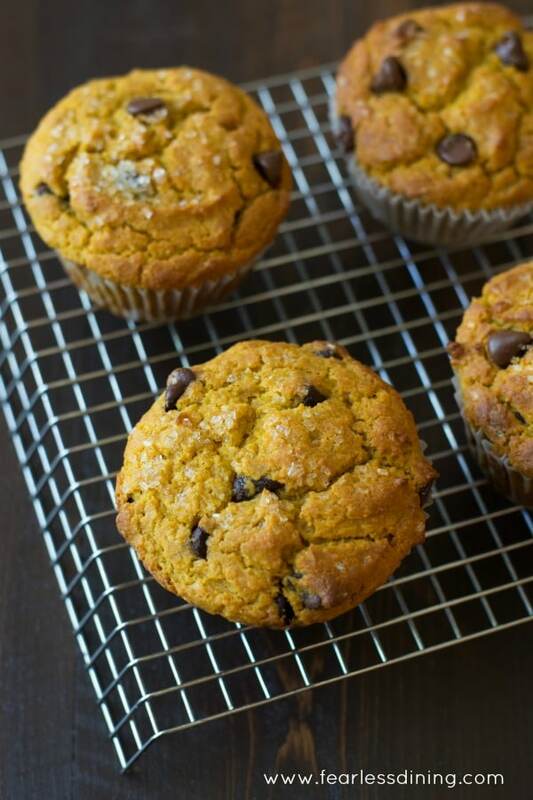 All of these easy gluten free muffin recipes are healthy enough for breakfast! Which will you choose to make first? Muffins are something we make a lot here in the Fearless Dining kitchen. They are light, fluffy, and they can be packed full of healthy ingredients. You can even hide vegetables in these…and your kids will never know!! Four of these easy muffin recipes are not only gluten free, but they are dairy free as well! If you end up with a few left over, you can even freeze them for another time :-). Freezing the extra gluten free muffins means you have muffins anytime. Defrost and you have the perfect grab and go breakfast! There are many things that can go wrong when you are baking gluten free. Don’t get discouraged, just follow these simple tips and you will feel like a professional baker in no time! Overmixing – Don’t overmix the batter. You want to have light bubbles in the dough. If you stir it too much, then the result will be a dense muffin. Leavening – If you put in too much leavening will cause the muffins to be more dense than fluffy. Make sure not to put in too much baking powder or baking soda, and your results will be much better. Oven Temperature – Periodically check your oven temperature to make sure that it is accurate. If you bake too hot, it can significantly affect the outcome of the gluten free muffins. Snacks – Once you taste a gluten free muffin for the first time, you will be hooked and nobody can tell they are gluten free! These are the perfect afternoon snack to get you through until dinner. Travel Food – If you are planning a trip and need some ideas of food that travel well, then these muffins are for you! Place them in an airtight container and hit the road. Baby Showers – How can anyone say no to amazing mini muffins at your next baby shower? Trust me; everyone is going to rave about them. Brunch – Fill your brunch menu with several of these easy muffin recipes and everyone will happily devour them! Can You Freeze Gluten Free Muffins? Yes, absolutely you can freeze gluten free muffins. To get the best results, I recommend individually wrapping each muffing with plastic wrap or in a small ziplock bag. Then you can place all of them in a larger ziplock bag or plastic container. This will help keep the air off of them and prevent freezer burn while keeping the flavors. To defrost the muffins, simply place them on the counter until they are thawed. If you are in a hurry, you can also toss them in the microwave for a few seconds. Make sure not to overheat them or they will dry out. What Kinds Of Ingredients Can I Add To These Muffin Recipes? 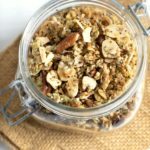 Nuts – Pecans, walnuts, and almonds are my favorites. 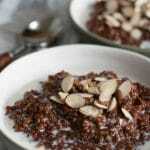 They add a little bit of a crunch and enhance the flavors. Chocolate – Everything tastes better with a little bit of chocolate. Use your favorite variety of chocolate chips. White chocolate, dark chocolate or milk chocolate all taste incredible! Craisins – I love the extra sweetness they provide and they pair well with muffins that don’t already have fruit. How Do I Store Gluten Free Muffins? The best way to store gluten free muffins is in an airtight container either on your counter or in your pantry. You want to avoid them getting too much moisture. Keep them away from heat. They will not age well if they get too hot. 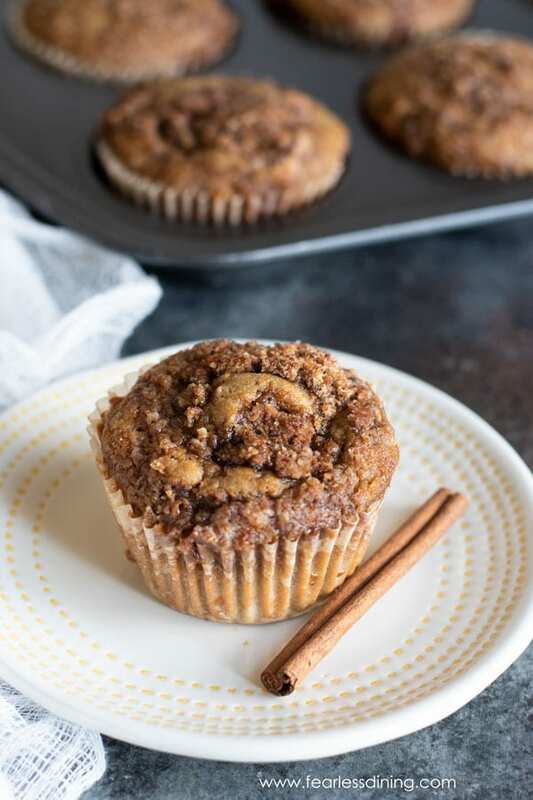 These gluten free cinnamon streusel muffins have such a sweet crumbly topping. It is hard to resist. These muffins have lots of blood oranges for extra flavor. Refined sugar free with a brown sugar option if you prefer. 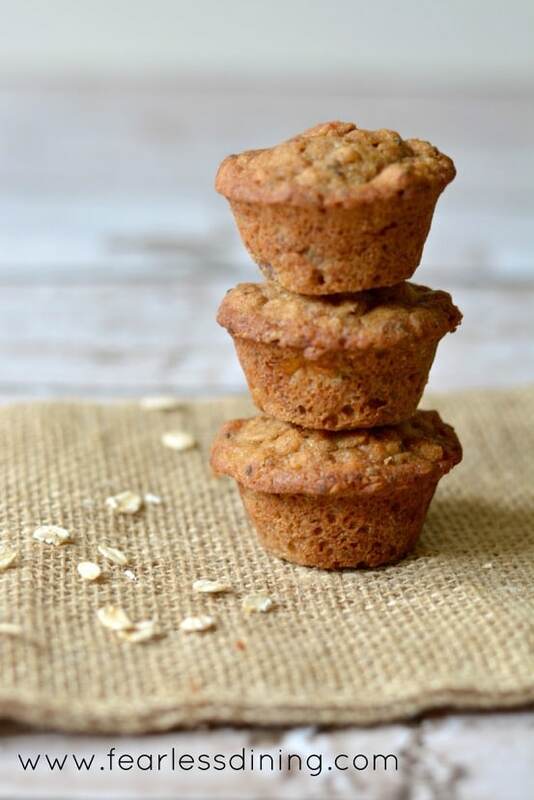 This is one of our family favorites, I include a short video of these Gluten Free Oatmeal Muffins so you can see how easy they are to make! They are freezable too so you can make a double batch and have them when you need. 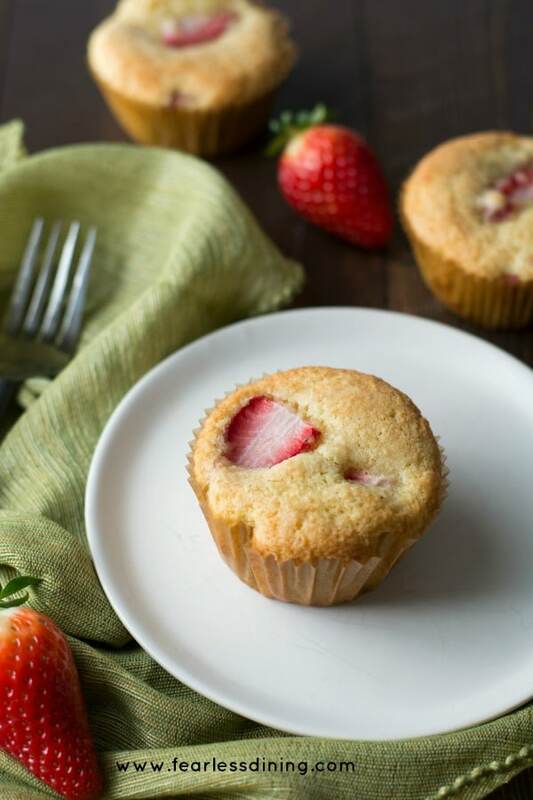 If you like a light and fluffy muffin, look no further than these Gluten Free Strawberry Muffins. You can use any fruit, but this recipe makes fluffy muffins every time! 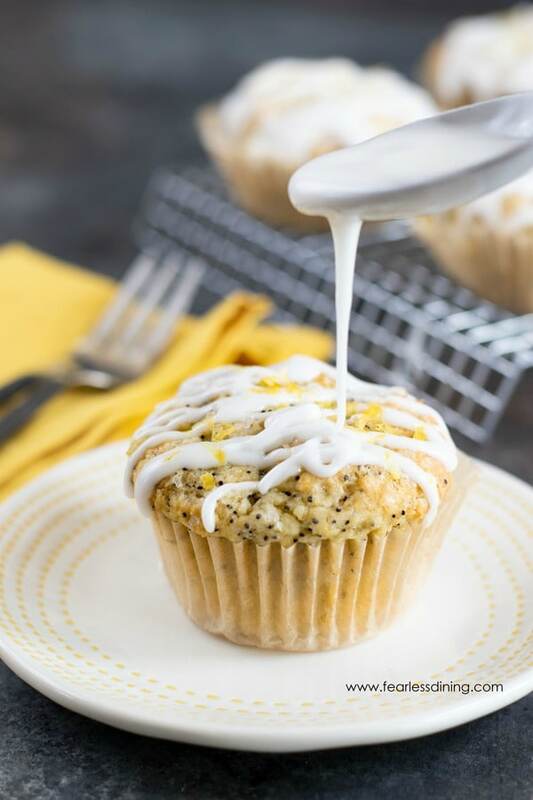 If you love lemon flavor, these Gluten Free Lemon Poppy Seed Muffins are a delicious option. A homemade lemonade icing tops these off. Paleo Breakfast Muffins are my favorite breakfast on the go for busy mornings. These grain free muffins are also freezable. Gluten Free Cherry and Chocolate Chip Muffins. Cherries may not be in season right now, but you can use frozen or dried cherries in place of fresh cherries. These Gluten Free Cranberry Muffins with a Streusel Topping are a delicious muffin you can enjoy anytime. 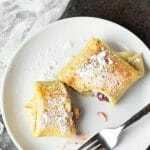 Substitute blueberries if you can't find fresh cranberries. 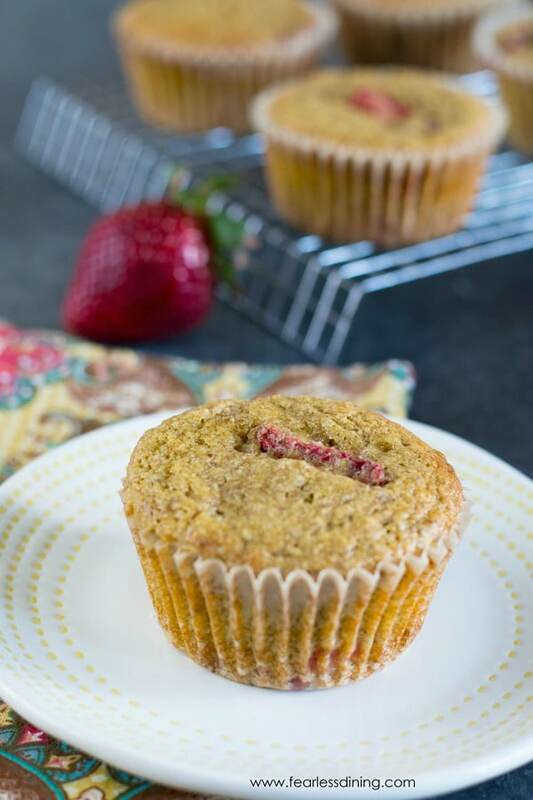 These paleo strawberry muffins are so light and fluffy you will forget that these muffins are healthy! Gluten Free, Dairy Free Blueberry Coconut Muffins are made with gluten free corn flour, making them a beautiful yellow color.These little muffins are freezable so make a double batch! Lastly, how about a savory muffin recipe? 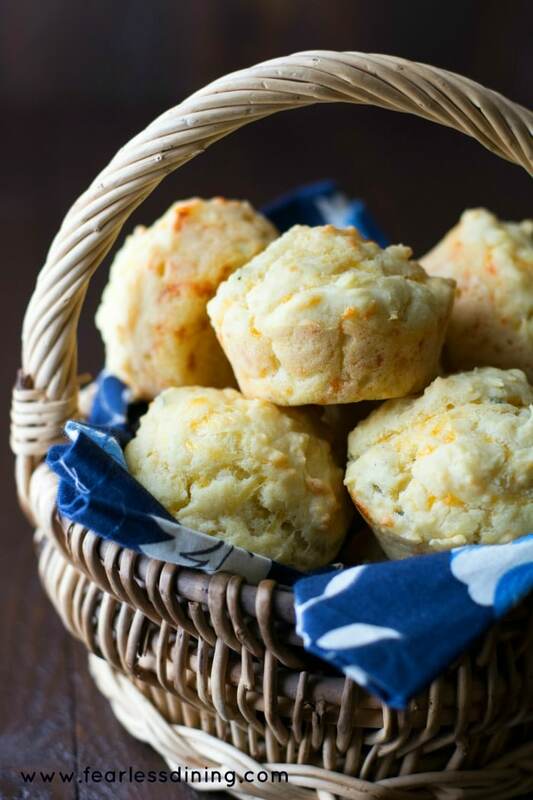 These Gluten Free Cheddar Herb Muffins are so good on their own, or dipped into a hot soup or stew! There is a video to show you how to make these fluffy muffins too! 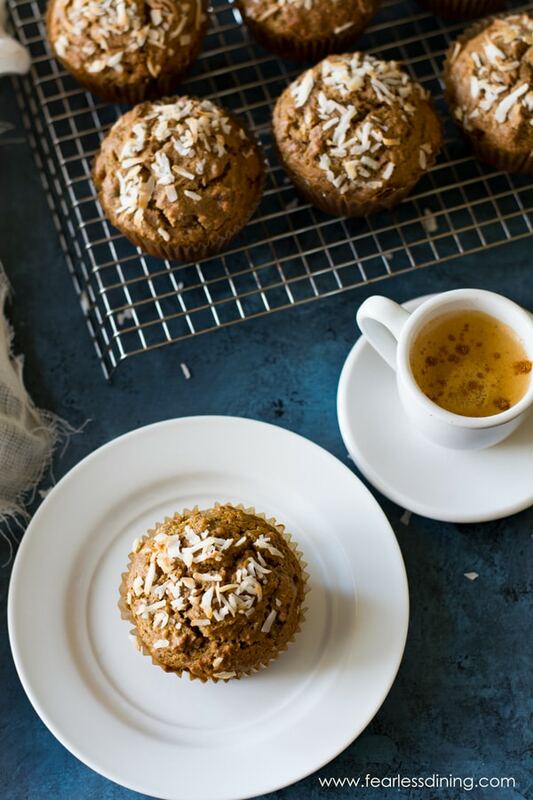 Pumpkin is popular in the fall, but why not enjoy these Gluten Free Pumpkin Muffins all year long? 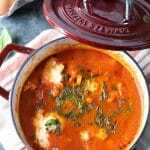 They are light and fluffy, which makes these a family favorite! Pumpkin adds so much added nutrition, you can use canned or bake your own pumpkin! 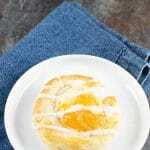 These French Toast Muffins make a delicious breakfast. Perfect for a grab and go breakfast! 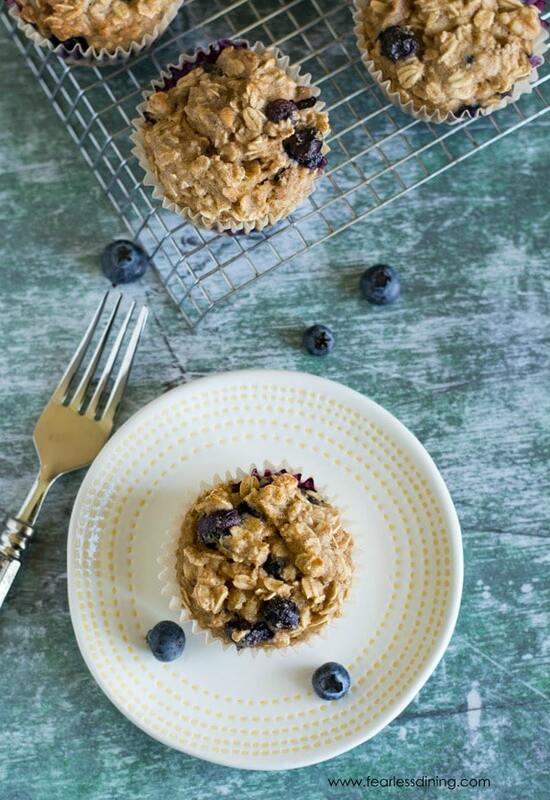 These Gluten Free Peanut Butter Oatmeal Muffins are for the peanut butter lovers. If you have a garden this summer, you may end up with a lot of zucchini. Try this easy Gluten Free Zucchini Muffin recipe to use some up. 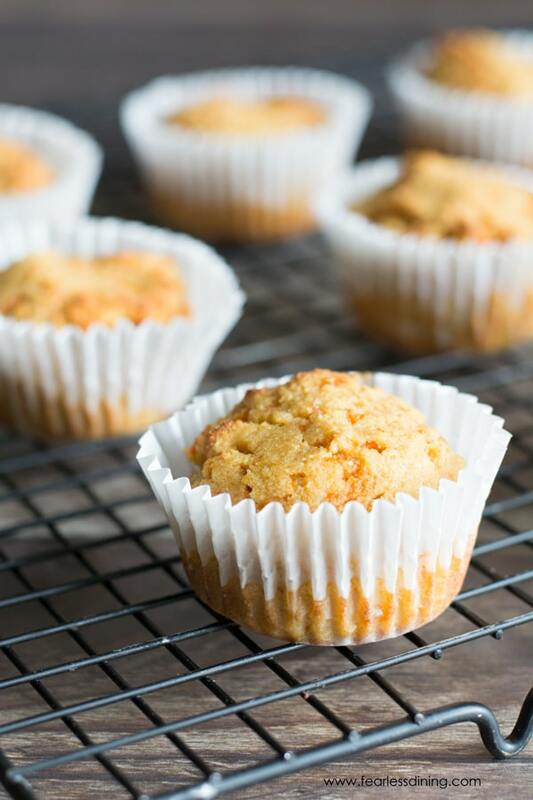 Your kids will never know these muffins are hiding veggies! And, if you are still looking for more inspiration, here is a link to all of the muffin recipes on this blog! Oh they all look so good. I’ve never had gluten free muffins before. I ought to get myself some gluten free flour to bake em. I keep sending all of your recipes to my GF friend hoping that she’ll make some of your stuff soon so I can try! Ha! This one’s going to her inbox too!